I decided to hold on past my usual Saturday night deadline for this post just to see if the extra day or two could shift the needle past pearly-gates and Uncle-Sam-wept cartoons to handle last week's outburst of All-American Violence. The results were mixed. Yeah, it's always hard when the cloud is this dark to look for silver linings to it. But I think one of the things - one of the benefits, if that's the - not an inappropriate word - of these horrible shootings in Minnesota and in Louisiana, combined with this horrible event in Dallas, is that it forces a little humility on every side of this sort of culture war. Yeah, that one's got it all: The discovery of an upside to violent death in our violent country; enforced humility, whatever that might be; and – my favorite – a "both-siderist" approach to the culture war. I stopped listening at that point. Then a few minutes later I had second thoughts– perhaps I had judged too harshly – maybe that annoying couple of minutes after all those years might not be a fair sampling. So I tuned in again, and found Fox News face Mara Liasson interviewing Melania Trump to determine what kind of a first lady the latter would make. So apparently I wasn't too harsh, and I needn't tune back in for another ten or fifteen years. Although with the benefit of hindsight and a big ol' wad of 2016-style cynicism, I suppose you could say Hillary Clinton supporters found a silver lining, since the horror of Dallas and St. Paul and Baton Rouge forced even her most implacable foes to divert their attention for a couple of days, knocking Benghazi, emails, and the FBI declining to bring charges against her off-screen. Same thing happened with Great Britain's turmoil after Brexit, although Americans were never going to be that interested in it anyway because first, we don't understand what the EU does (much the same could be said for most English voters who weren't young or living in London); and second, we don't understand how their parliamentary system works (what kind of system produces a new leader in four weeks instead of four years? ), and third, well, let's be frank – it's not the US, so who cares? And the hapless people whose job it is to explain why Donald Trump isn't a bigoted boor got a day or two off until He came roaring back to explain why a six-point star isn't a Star of David, no matter where he found it or how he used it. And the GOP convention organizers got a respite from explaining why Carrot Top declined a speaking slot. So, in lieu of our traditional p3 Picks of the week, we're going to break it down into who had a good week, and who had a bad week. Today's toons were selected from the week's offerings at McClatchy DC, Cartoon Movement, Go Comics, Politico's Cartoon Gallery, Daryl Cagle's Political Cartoons, About.com, and other fine sources of toony goodness. Jeff Danziger, Mike Luckovich, Clay Jones, Steve Kelley, and Brian McFadden. Jeff Danziger, Jim Morin, Matt Davies, Henry Payne, Joel Pett, Drew Sheneman, and Matt Weurker. p3 Best of Show: Brian McFadden. p3 "Pick Your Amendmen"t Prize: Dan Wasserman. p3 Certificate of Harmonic Toon Convergence: Bob Gorrell, Milt Priggee, and Ken Catalino..
Ann Telnaes captures a moment that many feared would never happen, and some true-believers might have trouble coping with now that it has. Tom Tomorrow discovers the truth. Duck and cover. Keith Knight struggles, as father, educator, and artist, to explain the naked lunch moment..
Red Meat's Bug-Eyed Earl wrestles with the problem of a niche readership. Mike Peterson, pre-dawn proprieter of Comic Strip of the Day, is taking time out, so to speak, for surgery, and has placed his blog in the capable hands of a friend and colleague. He's being a lot more taciturn about the whole thing than I would be, but then he has a pretty good explanation for why that would be so. Mike mentioned this a week or two on Facebook, but Liking it seemed pretty ghoulish at the time, so instead, I dedicate this song to him along with wishes for a speedy recovery. "Oh, won'tcha come and climb the mountain with me?" "I-Ski Love-Ski You-Ski," directed by Dave Fleischer in 1936, with uncredited voice work by Jack Mercer (Popeye), Gus Wickie (Bluto), and Mae Questel (The Slender One). Also uncredited, musical director Sammy Timberg (who, along with lyricist Bob Rothenberg), wrote the main theme song, "Won't You Come and Climb a Mountain With Me." By the way, the opening credits mention a patent-pending process used in the making of the cartoon; it's the stereoptic process in which different layers of background are painted on separate panes that move left-to-right as the characters cross the screen, creating a surprising sense of depth of field. Ex-Oregonian Jack Ohman brings up an interesting question: When they came to arrest Anne Frank, why didn't she arrest them right back? Hmm? Eh? Trump's got your number there, hasn't he? Documented Ex-Oregonian Jen Sorensen finds one aspect of the recent mass shootings and in-custody shootings that we can all get together about. Hint: For a lot of people, it slipped through the cracks of last week's stories, but it shouldn't have. Matt Bors sympathizes: It's tough to be a really good guy when those wacky coincidences keep getting in the way. "I bet I've got the best coincidences you ever saw! People love my coincidences!" 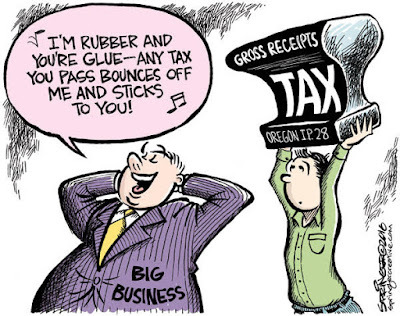 Jesse Springer has his doubts about the proposed Oregon corporate tax hike known as IP 28 – which puts him on the same bus as just about everyone else in the state who likes the fact that we have the lowest corporate income tax rate in the nation.